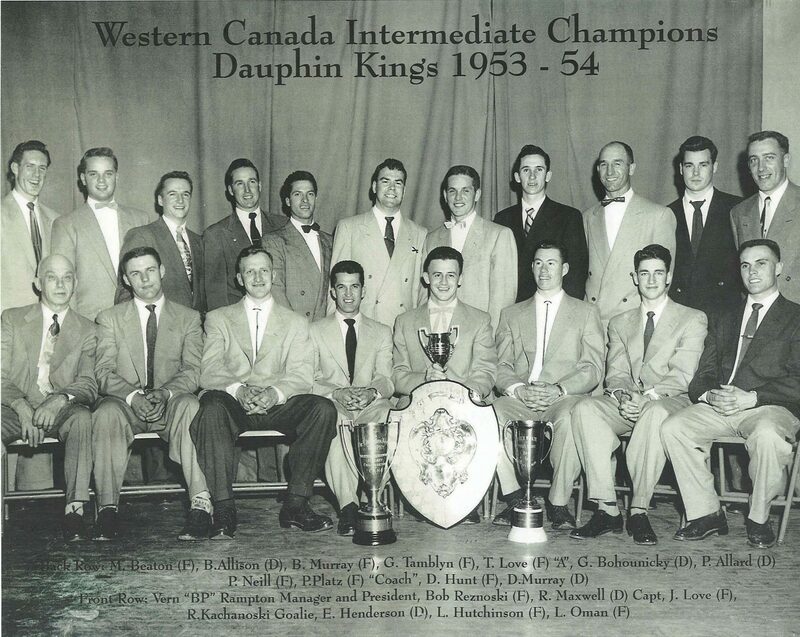 WESTERN CANADA INTERMEDIATE CHAMPIONSThe 1953-54 Dauphin Kings competed in the Big Six Intermediate Hockey League, considered to be the top Intermediate league in Manitoba during the Fifties. With Playing-Coach Paul Platz leading the way, this edition of the Kings finished in first place, then captured the league title and McKenzie trophy. The Kings advanced to the Provincial Intermediate "A" playdowns, eliminating The Pas Huskies and Selkirk Fishermen for the McDiarmid Shield. Next up, the Kings claimed the right to represent Manitoba in the CAHA Western Canada playdowns after beating the Intermediate B champs, Pierson Bruins in 3 games. In Brandon, before capacity crowds, the Kings dispatched the Lloydminster Jets in the Manitoba/Saskatchewan Final and then the Marathon Mercuries in the Western semi-final. In the Western Canadian Final against the Trail Smoke Eaters, the Kings grabbed a 2-0 series lead before Trail recovered with a win. In game 4, the Smoke Eaters looked ready to even the series taking a quick 4-0 lead before the Kings erupted with 5 straight goals and a 7-6 victory. The Smoke Eaters forced a Sixth game, but the Kings claimed their second Western Canada Intermediate Championship of the decade and the Edmonton Journal trophy with a game six victory.